Bognor boss Jack Pearce has moved swiftly to replace outgoing on-loan Pompey striker Dan Smith by bringing in Leon Maloney for the remainder of campaign. Smith has left the Rocks to switch to Cork City to develop his game in the League of Ireland Premier Division. And Pearce has wasted little time in bolstering the Bognor squad by drafting in attacking midfielder Maloney, 17. 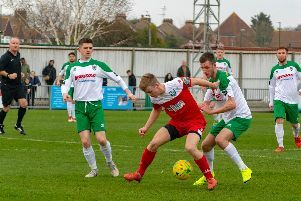 Maloney, a highly regarded prospect at Fratton Park, goes straight into the squad to face Haringey Borough in a Bostik Premier division clash at Nyewood Lane on Saturday. The youngster has represented the Rocks already a couple of times this season when he arrived along with another Pompey starlet, Freddie Read, for a brief spell. Maloney will team up with Blues team-mate Brad Lethbridge at the Lane. Bognor, who sit in fifth in the league standings, take on the second-placed visitors bidding to cement their place in the play-off picture come the business end of the season. And Pearce said: "Leon is highly thought-of at Pompey and we're delighted to be able to have him with us until the end of the season. Our relationship with Pompey is excellent and we look forward to helping to develop Leon, as we have with other players on loan. "Dan has gone to Cork City and overall he has done very well for us this season. We wish him all the best in Ireland and look forward to seeing his progress. "As for Haringey, they are a little bit wounded after losing at home last week and they will want to bounce back, so we know we must be at our best to gain a good result."